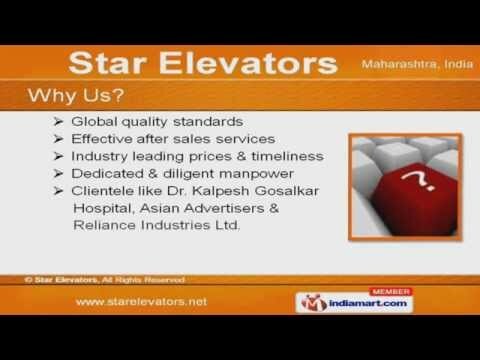 Welcome to Star ElevatorsManufacturer & Suppliers of ElevatorsThe company was established in 1995 at Mumbai. Our state-of-the-art infrastructure, large productioncapacity, stringent quality test & trustworthy vendor base have helped us to gain present repute in themarket. Global quality standards, Effective after sales services, Industry leading prices & timeliness have helpedus to gain clientele like Dr. Kalpesh Gosalkar Hospital, Asian Advertisers & Reliance Industries Ltd. Our product list includes Structure of Elevators, Elevator Functions & Passesnger Lifts. We offer premium grade Capsule Lifts, Goods / Freight Elevators(Electrical &Hydraulic Type Lifts) &Hospital Lifts. Our Commercial Elevators & Showroom Lifts ( Electrical / Hydraulic ) are a class apart. We are specialized in offering Internal, Outhouse, Bungalow, Home & Car Lifts. Along with that we offer Hydraulic Lift Platform Elevator Gear Boxes & Scissor LiftsElevator Buttons & Spare Parts are some of our best selling products.